This dated and dark bathroom went from a non-functional space to a luxurious master bath, harmonious with the contemporary yet rustic house it’s set in. 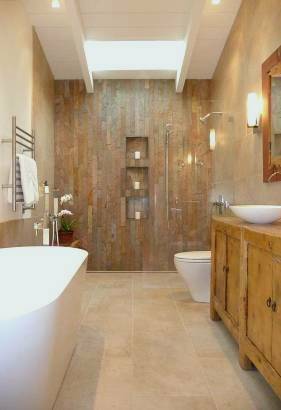 The original tiled tub/shower combination was replaced with a sculptural freestanding tub and a separate curbless shower. An antique Asian chest was chosen for its aged and rustic look and was combined with a custom live-edge redwood mirror and coordinating floating bench. The bench spans from the tub into the bright, open shower and serves multiple functions – from dressing seat to shelf for candles and flowers to shower bench. The lightness of the bench is accentuated by mood-lighting underneath, creating a stunning experience at night.